The Château-Gaillard is a ruined medieval castle located about 95 km north-west of Paris and 40 km from Rouen. The castle has had a rich history, being an important strategic point during the 100 Years War between France and England, as well as the temporary home of the exiled Scottish king. From the hill above the Chateau there is another and even more striking view. 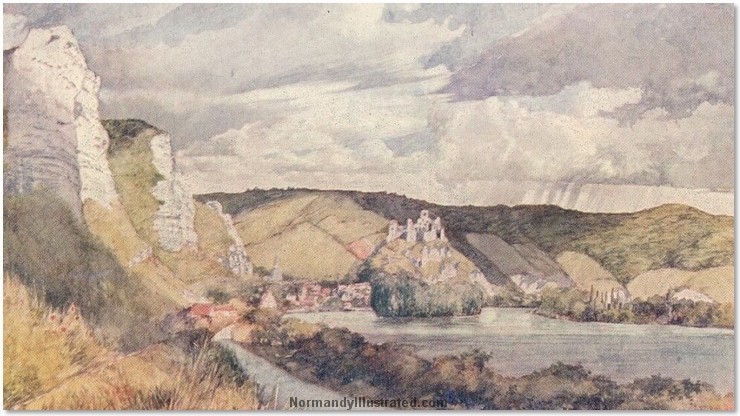 It is the one that appears in Turner's picture just mentioned, and gives one some idea of the magnificent position that Richard Coeur de Lion chose, when in 1197 he decided to build an impregnable fortress on this bend of the Seine. It was soon after his return from captivity which followed the disastrous crusade that Richard commenced to show Philippe Auguste that he was determined to hold his French possessions with his whole strength. Philippe had warned John when the news of the release of the lion-hearted king from captivity had become known, that "the devil was unchained," and the building of this castle showed that Richard was making the most of his opportunities. The French king was, with some justification, furious with his neighbour, for Richard had recently given his word not to fortify this place, and some fierce fighting would have ensued on top of the threats which the monarchs exchanged, but for the death of the English king in 1199.